"Just The Two Of Us" is a duo using sequenced tracks for the keyboard, bass and drums along with live musicians. 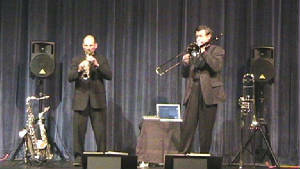 The "live" players are Victor Bird on trombones and Glenn Listort on soprano, alto, tenor saxes and flute. Vic and Glenn have been working together musically for over 25 years. Back up bands for the biggest stars, conventions, dances, weddings, atmosphere and receptions. They have recently formed this duo and are offering their versatility, experience and professionalism at a surprisingly affordable price. The duo was formed wth background music in mind and is perfect for receptions, dinners, weddings, anniversaries, house parties or any other occasion where a classy, great sounding, affordable live musical group is wanted or needed. Many of the places we’ve performed have also found the duo to also be a great band to dance to. 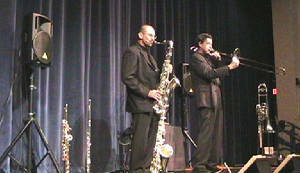 Their repertoire consists of smooth jazz, swing, light rock and latin. They come completely self contained and are available in Central Florida or anywhere in the entire state. The cost can be adjusted to fit almost any budget. Please click on the links below to see and hear samples of "Just The Two Of Us".